In mid-July I submitted the final version of my thesis to the library, and am now entitled to call myself Dr. Chawner. I don’t feel any different, though, and apart from the satisfaction of having completed (after far too long) a major piece of research, don’t expect my life to change. I’ve sent the abstract of my research to the people I interviewed, and to the discussion lists I sent invitations to complete the web-based survey to. In addition, I thought it might be a good idea to post a summary here, along with a few additional comments. The purpose of this research was to identify factors that affect participants’ satisfaction with their experience of a free/libre open source software (FLOSS) project. The research built on existing models of user satisfaction from the information systems literature, and also incorporated two characteristics of FLOSS projects first identified by Ye, Nakakoji, Yamamoto, and Kishida (2005), product openness and process openness. The central research question it answered was, What factors influence participant satisfaction with a free/libre and open source application software project? Richard Stallman’s reasons for setting up the GNU project and the Free Software Foundation arose from his frustration at being forced to be a passive user of software used for a Xerox printer. These suggest that being able to be an active participant in a FLOSS project is one factor that should be examined, and therefore the first sub-question this project answers is, What types of contributions do participants make to free/libre and open source software projects? Several studies have shown that the extent of participation in a FLOSS project varies from individual to individual, and this variation leads to the second sub-question, Do the factors that influence satisfaction vary for different types of participation? If so, in what way? A preliminary conceptual model of factors affecting participant satisfaction was developed, reflecting the key concepts identified in the literature. The main theoretical goal of this research was to test the model using empirical data. The research used a sequential, mixed methods approach. The first, qualitative stage involved reviewing documents from selected projects and interviewing a purposive sample of FLOSS project participants. The second, quantitative stage involved an online survey of FLOSS project participants, and the data gathered were used to test the conceptual model. I illustrated the relationships between the categories in a diagram that places ‘use’ at the centre (where I think it belongs, since ’software is for use’, to paraphrase Ranganathan’s first law of library science), and groups the other six categories in three pairs. There is more detail about why I used this grouping in the full thesis. One of the reasons I was interested in identifying different types of participation, and how they relate to each other, is that I feel that the onion-style model many people use to discuss what happens in a FLOSS community (which usually places code at the centre) overemphasises the importance of coding, and diminishes the importance of the user. I don’t mean to imply that coding isn’t important, but I think that other aspects of particpation are also important. Four attributes that modified these categories were also identified: organisational focus, role formality, remuneration, and time commitment. Data from 154 responses to the online survey were used to test the model using stepwise multiple regression, which determined the effect of each of the variables on overall participant satisfaction. Moderated regression analysis was used to test the effects of three potential moderating variables. The results showed that that perceived system complexity had the largest effect, decreasing satisfaction if respondents perceived that the software was complex, while process openness and perceived developer communication quality accounted for the most variance in satisfaction. The final conceptual model, based on the data, is below. 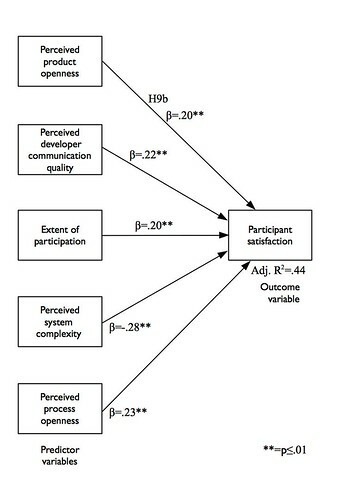 Overall, the model explains 44% of the variance in satisfaction; the β values show the standardised effect of each predictor variable on satisfaction. The main theoretical contribution of this research lies in its extension of satisfaction studies to FLOSS communities, showing that communication and openness are more important than in conventional software projects. Its practical contribution will help people involved in the management and governance of FLOSS projects to identify ways of increasing their participants’ satisfaction, which may in turn encourage them to contribute more. Ye, Y., Nakakoji, K., Yamamoto, H., and Kishida, K. (2005). 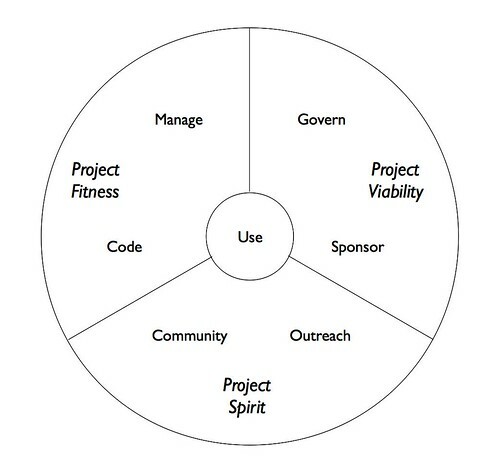 The co-evolution of systems and communities in free and open source software development. In Koch, S., editor, Free/open source software development, pages 59–82. Idea Group, Hershey, PA.
I’d welcome comments on the results here (while comments are open), or by email to me at brenda.chawner@vuw.ac.nz. I spent most of last week at LCA2010. For those of you not familiar with it, LCA is short for linux.conf.au, a conference held annually in Australia or New Zealand that focuses on free and open source software, particularly Linux. Because the conference was held in Wellington this year, I decided to go, even though I am not the typical attendee. For a start, I’m the wrong gender (female), and the wrong age (middle), and I certainly don’t identify as a ‘hacker’, at least not any more. Glyn Moody, a journalist who writes about free and open source software and related issues. I owned Glyn Moody’s book Rebel Code, and had cited an article by Colman and Hill in the research proposal for my PhD, and I thought it be very silly to pass up the opportunity to hear what they had to say when they came to Wellington. However, when I looked at the draft conference programme, other sessions caught my eye, particularly the ones to do with building and supporting a project’s community, and the threats software patents pose to FLOSS development. In addition, the miniconfs on Monday and Tuesday covered a number of my interests, including Education, Business of Open Source, and Haecksen and Linuxchix. So I decided to go, and I certainly wasn’t disappointed. Each of the keynote speeches was very different, but at the same time they all had a common thread: the importance of software freedom and its broader implications for our society. I found that there was plenty to choose from for the rest of the day, and overall I enjoyed the talks I attended very much. I was particularly struck by what appears to be an increasing emphasis on supporting and encouraging members of a project’s community who fall into the ‘user’ category, and I got a strong sense that some members of the the hacker community are starting to acknowledge that there is more to life than coding. However, this is still a conference aimed predominately at hackers, and the Wellington Perl Mongers organised a ‘HackOff’ event (subtitled ‘Coding Just For Fun!’) on the Wednesday evening (see HackOff2010 for more information). The conference is described as being “run by the community, for the community”, and I definitely got the sense that people who attend lca regularly see themselves as a community. One person I chatted to told me that he planned his year around going to lca, and I can now see why. The people were friendly, and easy to talk to during the breaks, and overall the tone was casual. One thing that I noticed was the lack of any trade exhibits, which meant that people at the conference didn’t feel pressured to ’support the sponsors’ during the breaks, and could instead talk to each other without feeling guilty. The sponsors weren’t overlooked, though; their names were displayed in the main auditorium during the announcements and keynote addresses, and they all had an opportunity to have stands at the Open Day, which attracted a range of people. As a first-time attendee, I was particularly struck by the strong traditions that have built up since the first conference (initially known as CALU: Conference of Australian Linux Users) was held in Melbourne in 1999. To take just two examples, the conference dinner is known as the ‘Penguin Dinner’, and the conference ends with an ‘open day’ to promote free and open source software to the public. This was also worthwhile, and the stands included representatives from Google, Status.net, Wikimedia Australia, the New Zealand Open Source Society, CatalystIT, Moodle, IBM, Canonical (Ubuntu), AmberDMS, RimuHosting, and Digital NZ, to name just a few of the ones that caught my eye. I managed to buy a copy of Geek Prayers, a self-published book by David Merritt, as a memento of the day and conference. One other bonus was that I was able to meet a number of people I had previously only known through email or Twitter/Identi.ca, including Dave Lane (@lightweight) from Egressive, Lynne Pope (@elpie), and Nic Steenhout (@vavroom), and had some good conversations with them and others. Next year’s lca will be held in Brisbane, and I’m already wondering if I should go. Last month I bought an HP Mini 5101 netbook computer, and was particularly pleased because I managed to buy it without Windows. It came running SUSE Linux Enterprise Edition (SLED), which I used for the first month while I was waiting for the next release of Ubunutu: Karmic Koala, in particular the Netbook Remix. There was nothing particularly wrong with SLED, but it was a bit too ‘corporate’ in look and feel for me. I also wanted to have the sense of ‘ownership’ that comes from choosing (and installing) my own operating system. Last week I installed UNR 9.10, and so far I’ve been happy with it. Overall the installation process was fast and smooth, with just one annoyance. I needed to install a proprietary driver for the wireless card, and that didn’t go quite as smoothly as it should have. Fortunately someone else has already documented what to do on the Pass the Source blog: Koala Bites Man (thanks, John). Most of the time I’ve been writing plain text using gedit (it’s easy to use, came as part of the basic installation, and I’m lazy), but yesterday I decided to try OpenOffice Writer. The first thing I discovered was that the spell checking didn’t work—I’m not sure if I missed a step in the installation process because it was new to me, or if it happens to everyone. This post documents how I fixed it. setting the locale to New Zealand (via Tools -> Options -> Language settings -> Languages). I’m not completely sure if the last step is necessary, but everything is working now, and I’m happy. Somehow ten months have gone by since I last posted. It’s been a busy year. I was the LIM Programmes Director until the end of June, and then was busy teaching and organising a national speaking tour for RMS, which finished with him in Christchurch, where he was a keynote speaker at the LIANZA annual conference. I’m really glad I took on the role of RMS tour organiser, but it was pretty intense at times, and definitely interfered with PhD progress. Nonetheless,I’ve been chipping away at my research, looking at the data I so painfully converted into something usable, and am now on Research and Study Leave until the end of October 2010. It should come as no surprise to anyone that my top priority is getting my results written up as soon as possible, and then moving on to turn the PHD into two (or maybe more) journal articles. Watch this space for more regular updates. Somehow I never seem to have much to say about my research project, but that’s going to change over the next 6 months. I need to have the thesis finished by June 2009, which means that my priority for the first half of 2009 is going to be analysing the data and writing the thesis. I was very pleased with the response to the online survey: I received 206 responses, from all over the world! Most of them look usable, and many more individual free/open source projects were represented than I expected, and one of the things I’ll do here is mention some of the ones that were new to me. The range of responses means that the data is more ‘random’ in some ways than I expected, which is probably a good thing. I’ll start summarising my findings here once I start working with the data. One comment: the open source software I used to gather the data is from an abandoned project, and hindsight now tells me that I shouldn’t have relied on it, even though our systems administrator told me that other people had used it for big surveys. I used it for a shorter survey in 2007, and I thought that I understood its quirks well enough to use it for this one. Unfortunately, that wasn’t true, and I’ve spend the last two days converting the data from its rather idiosyncratic (and verbose) XML output to something I can work with more easily. The biggest challenge was the fact the it only output data for the questions that people had answered, so I had to identify the missing values before loading it into an anlysis tool. This was complicated by the order of the results, which were not sorted by question number, but were instead presented in the order I had defined them. But I have finally gotten the data in the form I want, through a combination of XSLT, a text editor, and a short php program. I’ve done enough double checking to be confident that everything’s there, and correct (whew!). If I do something on this scale again, I’ll probably use LimeSurvey, which looks good and seems to have a very supportive community. This very short entry is just to record the TinyURL for the survey: http://tinyurl.com/4wgce7. I plan to print it on some small cards and hand them out at the LIANZA conference if anyone I talk to is a free/open source software user and is interested in completing the survey. Ranganathan expressed his second law as ‘every person his or her book’. As with the first law, he came up with this law in response to his observation that books were restricted to a small number of privileged people. Interpreting this law in the context of open source software is easy: conditions 4 and 5 of the Open Source Definition say that software must not be restricted from individuals or groups or from specific fields of endeavour. It is tempting to suggest that Ranganathan saw the second law of library science as the most important, since he spent three chapters (of 9 total), comprising 178 pages (roughly 1/3 of the book) to discussing its struggle, global uptake, and implications. Freedom from, or Freedom to? Today I started reading Barry Schwartz’s The Paradox of Choice. On page 3 of the prologue, he talks about the difference between ‘freedom from’ and ‘freedom to’. Schwartz came up with these phrases based on Isaiah Berlin’s essay “Two Concepts of Liberty”, published in 1969. Since I finished the last face-to-face interview transcript yesterday, and am just waiting for two of the email interviews to be completed (I’ll send out follow up messages again tomorrow), I’m finally ready to start analysing the data. I’m looking forward to seeing what additional ‘freedoms from’ and ‘freedoms to’ I find, if any. I’m still mulling over how Ranganathan’s second law, ‘Every person his or her book’ can be applied in the context of open source software. Watch this space for my conclusion. I also have a movie/DVD catch up post to write. We’ve recently seen Borat, Pride and Prejudice (the 2005 movie), A Prairie Home Companion, and The Corpse Bride. Eclectic is probably the only word to describe the list. Ranganathan came up with his first law, Books are for use in response to his perception that, at least in the 1930s, many librarians believed that books are primarily for preservation. In discussing the consequences of this first law of library science, he talked about extending library hours, improving library furniture, hiring the right type of library staff, and providing a readers’ advisory service, all of which contribute to increased use of books. We tend to take many of these things for granted now, largely as a result of Ranganathan’s vision. However, he didn’t talk about what ‘using’ books involved, perhaps because he thought it was self-evident: people use books by reading them. In considering whether the first law of open source software is that Software is for use, the question that comes to me first is “what does ‘use’ mean?”. Most people would probably respond by saying that to be able to use software, the code needs to run without errors, and the prospective user needs to have enough information about its requirements (for example, the operating environment and any dependencies) to be able to get it working. In other words, documentation is needed in order to be able to ‘use’ software. I don’t think this necessarily means that developers need to write complete user documentation, though. Well-commented code, with some brief instructions, might be all that’s needed for a simple program, but as the software increases in complexity (as the number of scripts/components increases, say), there is an increased need for good documentation, if end-users are to be able to use it. However, unlike books, which have one primary use, source code can be used in other ways. The Free Software Foundation’s four software freedoms identify other types of use, including being able to study the software to learn how it works and being able to improve it. While it seems clear that developers release code under an open source license so that it can be used in some way, it doesn’t necessarily follow that they are thinking of end users with limited technical skills when they do so. They might simply be hoping to encourage other developers to study and then improve the software. This could be one of the reasons for the Jekyll and Hyde personality of open source projects Karen Coombs recently discussed, with some developers releasing their code primarily for other developers, and not for end users. One other point to mention here is that one route to ‘opening’ up source code seems to come from funders. I’ve never seen anyone else talk about it, but the Mellon Foundation Intellectual Property Policy gives people a strong incentive to release software funded by a Mellon grant as open source. Some of the high-profile library/information management open source projects, such as dSpace and Fedora, have received Mellon Foundation funding. I suspect that IMLS grants carry a similar requirement, since many IMLS-funded projects are also open source.